To stand on top of a Himalayan peak, and feel the sense of achievement of having scaled a mountain much bigger than anything in the Alps is the ‘ultimate dream’ for many trekkers, and indeed climbers thus brings out your peak climbing in Nepal. In 1978 the Nepal Mountaineering Association designated a number of Nepal peak climbing peaks throughout Nepal as ‘trekking peaks’, which could be attempted with a minimum of bureaucracy or formality, and this has allowed the ‘dream’ of a Himalayan ascent to be realised for many people. A more appropriate title, however, would be non-expedition peaks as none can be ‘trekked up’, and some present serious mountaineering challenges. 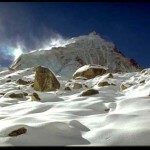 We detail two of the most popular of these peaks – the highest, Mera Peak, and one of the most stunning, Island Peak. 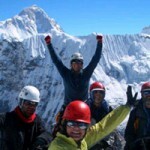 These trips are ideal for those wishing to combine a trek with an ascent of an accessible Himalayan summit. Departure: Any date for group of 3 person and more. Season : Mar to May and Oct to Dec.